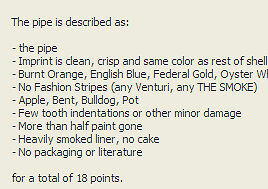 The value of pipe #662 is 18 points. Cindy Siders (acs98) offered a lot of three pipes on eBay. It had two Pots - a white and a blue - that might have been a completely different paint job from any I had. It also had a Blue Venturi Bent. When I got them it was obvious that an owner apparently tired of the paint chips and scratches in the orignal paint and took a buffing wheel to create the interesting pattern. I am not going to try and collect every modification made by owners of these pipes so all three are now Pipes for Sale. They look like they'll clean up OK and be satisfactory smokers. As to the paint, well, that's a matter of taste isn't it? Thomas Lovett decided to give this one a whirl.